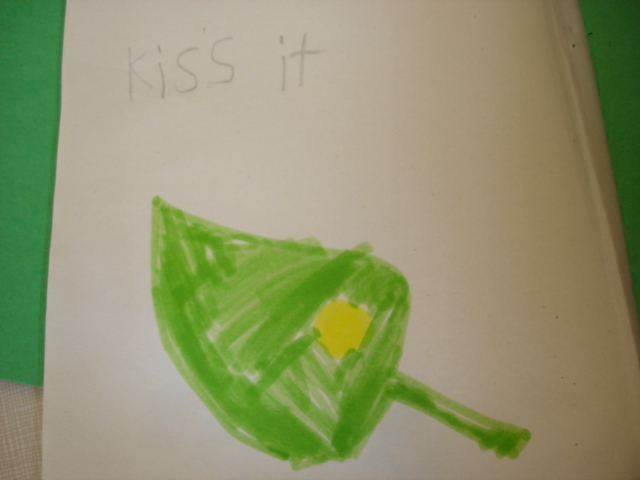 Butterfly Inquiry: Inspiring Young Authors with Tap the Magic…Egg? As mentioned previously on the blog, my students were totally inspired by the book Tap the Magic Tree by Christie Matheson (you can read about it in Books That Inspire Young Authors). 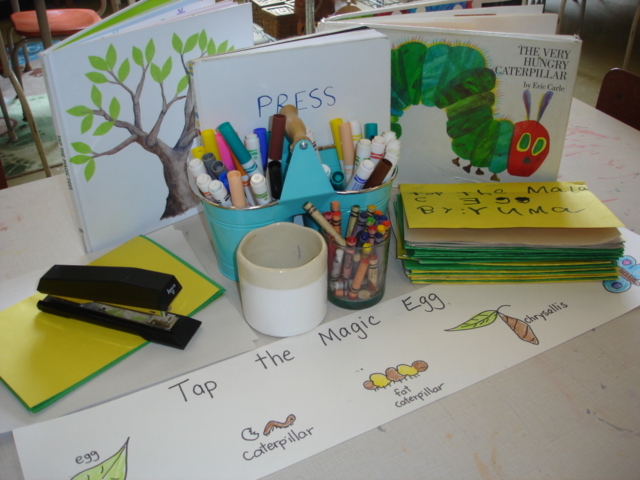 When it came time to design some provocations for the writing table for our butterfly project, I was thinking about how I could give the children an opportunity to show their learning about the butterfly life cycle. 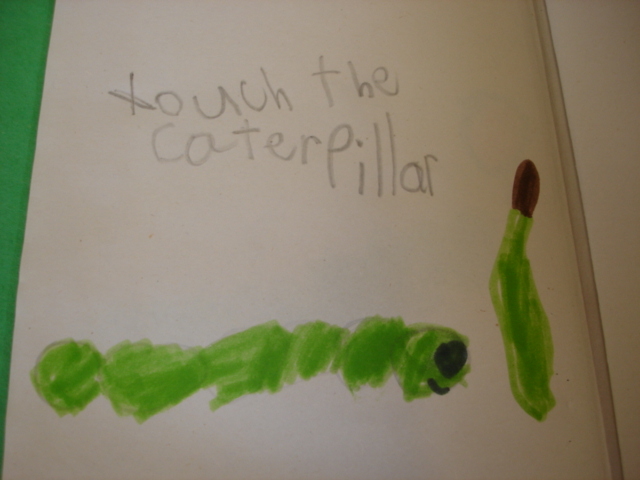 Since the children were already familiar with the cyclical nature of Tap the Magic Tree, it seemed like a good jumping off point for talking about the cycle of how caterpillars grow and change. 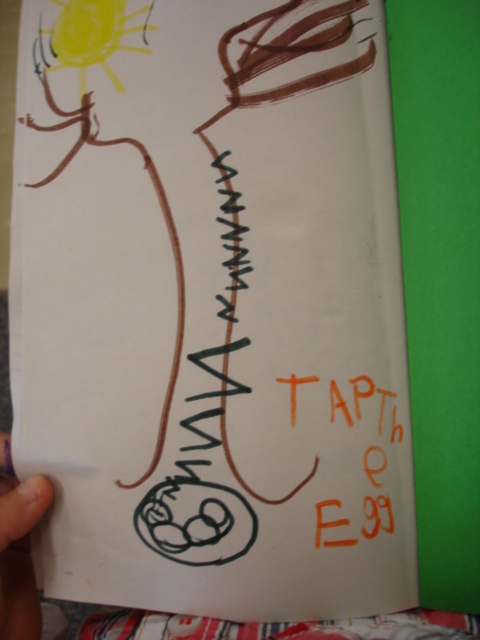 As a class, we brainstormed a version of Tap the Magic Tree called “Tap the Magic Egg” (which, of course, the children were completely excited about!). 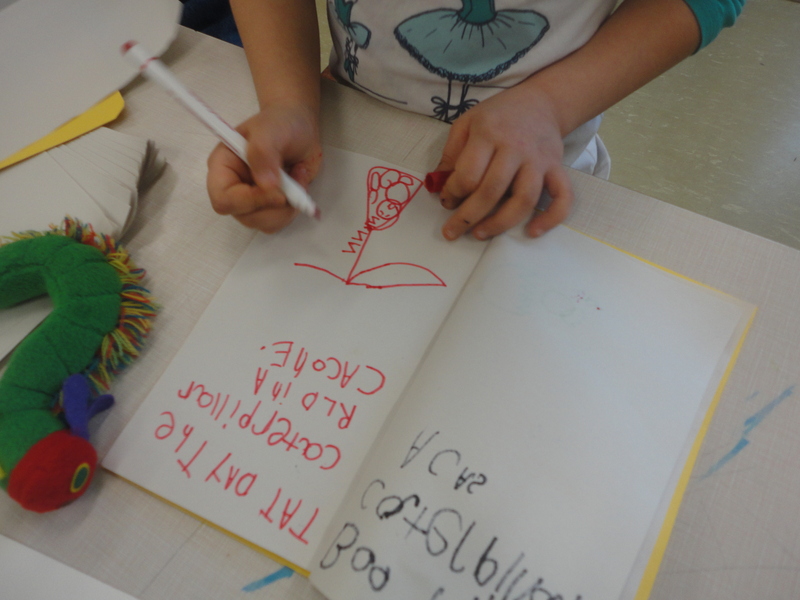 After some modelling with the entire class, we placed some inspiration books, book covers, newsprint, and sample vocabulary at the writing table. As with our other Tap the Magic Tree experiences, this centre was immediately jam packed with children creating their own life cycle stories. I was able to assess the children’s understanding of the concept, but each story was unique to the child who wrote it. We certainly got a lot of enjoyment out of hearing the stories read aloud at reflection time! You can read more about our butterfly project by clicking here. 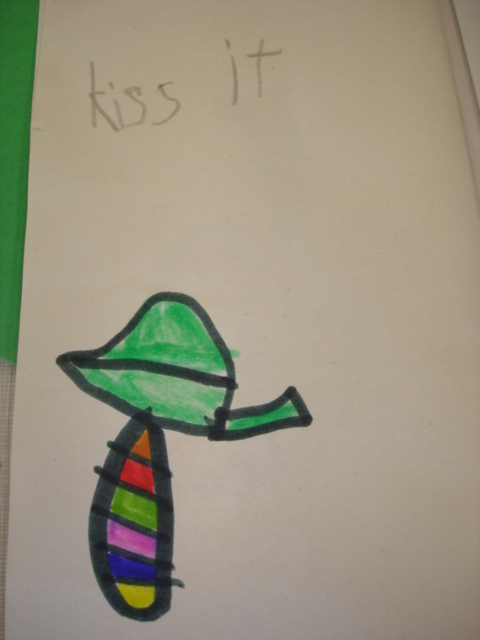 This entry was posted in Provocations, Science and Technology, Writing in Kindergarten and tagged Alexis McDonell, butterfly inquiry, butterfly life cycle, butterfly writing activities, Tap the MagicTree, Writing, writing centre, Writing centre in Kindergarten by msmcdonell. Bookmark the permalink. 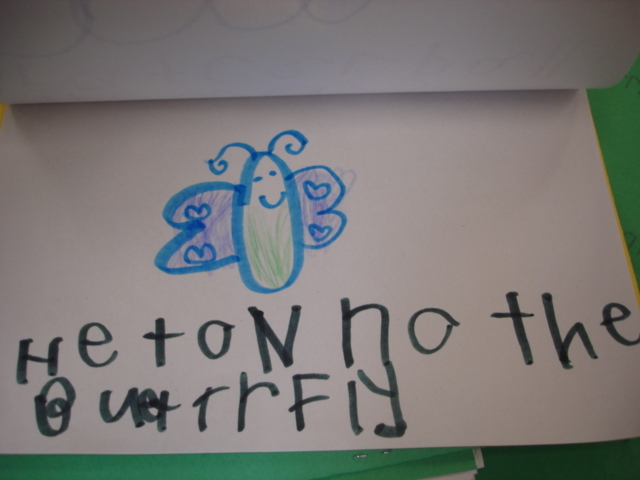 I noticed that sometimes you scribed for children, and sometimes you wrote the correct words/sentences in small print near the child’s writing if it was difficult/impossible to interpret. I have seen this a lot, but I have heard some teachers say that they never write on children’s work; they sometimes write on sticky notes on the back. I see advantages and disadvantages of both (ex: the child him/herself sometimes doesn’t remember what he/she wrote just a few hours later; the parents don’t know what the child wrote; sticky notes can fall off and the child doesn’t have the benefit of seeing the correct words/spelling; etc. What are your thoughts about this and where do those thoughts come from (your experiences, books, workshops, research, etc.)? Hi Monique! Great question. 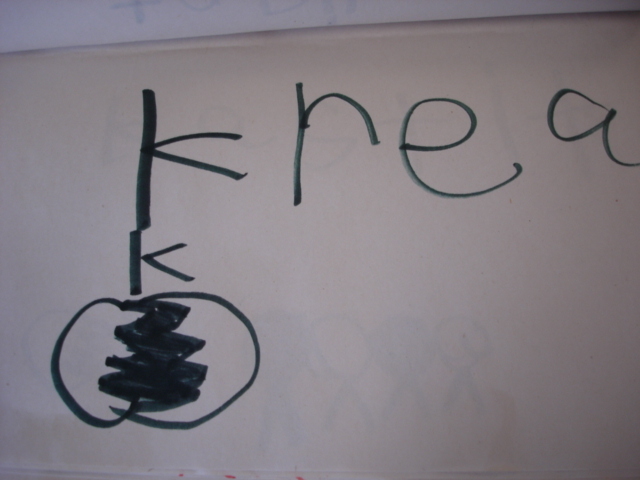 As a general rule, I do not write or scribe for children. The children are encouraged to develop writing skills at their own pace and are supported with various resources and experiences (daily writers workshop, word wall, etc.). During writer’s workshop I will record the children’s stories on sticky notes and put them on the back of the page (as you mentioned). I learned this strategy from What’s Next for the Beginning Writer. I noticed once I switched to this strategy, the children’s writing skills developed at a much faster rate and the stages of writing development were more visible. I say this is my “general rule” bc I have found that some children need some additional support/encouragement during writing in the form of a “shared writing” experience with their teacher. In this case, I’ll scribe or share the pen with the student as a method of building confidence/motivation for writing. The tiny print you see on some of the pictures was added at a later date for the purpose of capturing the child’s thinking for the blog.